The candidates are informed that the Commission is likely to hold the HCS (Ex. Br.) and Other Allied Services Main Examination in the month of June/early July, 2009 at Chandigarh or anywhere in the state of Haryana. However, the exact schedule for holding the examination will be notified in newspapers at least one month before the commencement of Main Examination. The candidates are directed to obtain the Application Forms for the Main Exam w.e.f. 08.05.2009 from the office of the Haryana Public Service Commission, Bays No. 1-10, Block-B, Sector-4, Panchkula by giving full addresses along with identification proof. For further details candidates are directed to refer to the Brochure for HCS (Ex. Br.) and Other Allied Services Examination issued to the candidates earlier and Instructions and Information for candidates attached with the Application Form. The application form duly filled for admission to the Main Examination must reach Commission's office Bays No. 1-10, Block-B, Sector-4, Panchkula by post or by personal delivery by close of office working not later than 25.05.2009. The Commission will not be responsible for any postal or courier delay and all such application forms received after 25.05.2009 will be out rightly rejected. In today's Hindustan times newspaper published from delhi, there is an advertisement that the candidates who have not qualified for the HCS can check their marks from www.hry.gov.in but I can't find the site or any other link in internet. HPSC not even posted the result on Haryana govt. website and I have doubts whether they will put marks of selected and not selected candidates. hello Karan I also not find any such site whenever I will come across with that, will surely share with you all. I think they are not there on net for now also haryana.gov.in also not give any clue abt that. I am unable to see the marks obtained by Candidate in HCS(Ex)on any Govt site. What keeps you moving in this selfish world? It is amazing to learn about some person like you doing great help for fellows free of cost. Thank you very much. Are eligibility conditions for HCS and RAS are same? Is HCS as regular as RAS? Thanks for your comments. I would like to know about few good books for Rajasthan GK paper in mains 2009 exam. bhalla's book is good one you can also see lakshya series on ras mains also. Thnx Thnx yaar Thanx a lot u r a great man boss ...! hello sir. would u suggest me books of G.K n sociology for hcs main exam. hi naresh, did u also appeared for HCS, must be among the successful candidates. Any predictions regarding RAS (P) 2009 notification. there is no news of RAS(P) 2009 as of now; but if RPSC is to be believed then it may be conducted every year so one can expect it in Sep-Oct.
the site has marks of only unsuccessful candidates as I mentioned above. really a useful site.any idea when hcs mains wil start? very uyseful site.any idea when hcs mains will start? @ Varleen : the date is not yet declared some said that it will start from 29th June but thats a rare possibility, also some court cases are pending in the court which may be considered before HPSC come out with the time table. I heard that HPSC found some system error during rechecking of some answer sheets. i came to know that HPSC lowers down the cut-off also but no formal communication. Do you have any information regarding this matter?? Yaar what's hell HPSC is doing?? @ Vikas : you are right dear there may be sth cooking inside HPSC. As you see the marks of those not selected in PRel has been displayed whereas marks of those selected has not displayed not communicated, secondly one has to come to panchkula to brought mains form and the biggest thing is that they not provide question paper of Prel exam. HAving said that I wud say that I heard that some students approached HC regarding some questions and HC ask for some clarifications and also heard I repeat only heard that HPSC is allowing some more candidates in mains exam. Well only HPSC knows what it is doing after the mess they have created in earlier exams one has doubts in the intention of HPSC. Rest lets see what happen. Yaar things are happening this way since last one decade and this is horrible man. HCS becomes a joke now. Why media is mum on the issue? Ok naresh can we do something in this issue. * HPSC didn’t declare marks obtained by successful candidates in Preliminary exam and same is not informed to them. The candidates were directed to obtain the Application Forms for the Main Exam w.e.f. 08.05.2009 from the office of the Haryana Public Service Commission, Bays No. 1-10, Block-B, Sector-4, Panchkula and submitted same before 25.05.2009. I am really surprised that why media remained inactive or silent in between regarding credibility of public commission when HPSC continuously remained accused of opaqueness in working since last decade. wats up?i mean any idea when hpsc will take hcs(exe) mains exam? hoz life going on?plz give some clue when hpsc wil take hcs(exe)mains exam? No new updates for now and chances are bleak that it will happen recently it seems government is busy in calculating its chances to go for election also one can expect atleast a month in advance abt exams but PSC seems to forget that agony of candidates also there is no website of HPSC and one has to rely on sources which may or may not be true. Lets see whats the HPSC has in its kitty until then keep ur fingers crossed. hello sir.. i m an aspirant for HCS. can u plz tell me how often are HCS exams held ??? 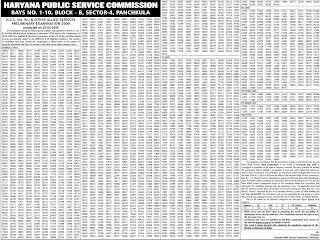 It is supposed to happen yearly but like other PSC its also no different and has no clear cut calendar. hey can anyone tell when is HCS mains 2009 exam result to be declared????? Can you please provide me previous year preliminary question papers for GS and Sociology.Woul be extremely grateful. Can u please provide me previous year question papers for the preliminary exams os GS and Sociology for HCS(Ex. Br).Would be very grateful to you.